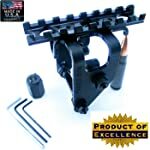 When looking for the best SKS scope mount, you know that you are up for more daunting challenges unimaginable. That’s because there are overflowing options on the market. We make sure you don’t go through that grueling experience. Our top picks will give you the possible match for that sound purchase. The affordability of the scope mount must never undermine its quality. The good news is that you can find a wide range of rifle scope mounting accessories that deliver both quality and cost effective features. Is one of our top options the best SKS scope mount based on your allocated budget? UTG Pro SKS Mount: This model is on top of the scale when it comes to the price tag. You just need to shell out extra cash if you want to invest on durable, consistent, and precise target. The steel base component and other innovative designs incorporated in the accessory are few of the factors that contribute to its much pricier rate. Brass Stacker MN9130SSM Mosin Nagat Rifle Scout Scope Mount: The brand is known for its mid-range scope mounts. It’s a good quality product with notable features such as the complete kit tools for installation and complete detailed manual. You get a great deal with this rifle accessory given its moderate price. Global Sportsman SKS Mount: This is the ideal option for those that prefer a budget-saving scope mount. The solid and high quality construction of the mount is quite impressive for such a much cheaper option in our selection. The quality of the scope mount is generally gauged through its precision of alignment. Mounts must perfectly align with the weapon when mounted. They must also have the capacity to maintain absolute alignment especially when absorbing recoil forces again and again. The best mounting systems also secure the optics on an eye level that would give you the perfect shot. UTG Pro SKS Mount: The model boasts of precise alignment through its innovative mounting system. It maintains great zero holding especially when extensively tested on the field. Rifle enthusiasts and field experts commend the 22 slots feature for flexible optics application so that you can adjust the alignment to your desired position. Brass Stacker MN9130SSM Mosin Nagat Rifle Scout Scope Mount: The mount is designed for rear sight blocks. There are notable issues especially with the block and dovetail underneath, affecting the alignment of the mount with the bore axis. Global Sportsman SKS Mount: The scope mount received a considerable amount of accolades from rifle enthusiasts however there are also letdowns. It is well-built and solid but the platform has issues on the function especially for forward positions in the rear sight. It may also work well with a bipod accessory. The first thing you need to look at when gauging the mount’s durability is the materials. What is the product made from? The overall construction of the scope mount also plays a crucial role how tough it would get in the harshest weather and shooting demands. Is one of our picks your perfect match for durability? UTG Pro SKS Mount: There is always something strong and resilient with a high-strength steel base and this mount is made of one. The precision machined rifle accessory also comes with a wide range of features to exceed the most rigorous requirements. It provides strong and solid security for your mounted scope even with repeated recoil forces. Brass Stacker MN9130SSM Mosin Nagat Rifle Scout Scope Mount: For a mid-range scope mount, this model is absolutely a great deal. It is durable with its rigid steel construction and black oxide finish. The integrity of the rifle accessory is a product of a combination of the different technologies loaded into the scope mount. Overall, the strong and resilient steel construction makes it a good contender for the durability race. Global Sportsman SKS Mount: The maximum strength of this model is attributed to its precision machined aircraft aluminum alloy that undergoes the anodizing process. All in all, the solid quality is quite a good match given its much cheaper price tag in our list. The best SKS scope mount seamlessly fits the rifle. It secures the scope and prevents it from moving or shifting event with bumps and repeated recoil forces. After all, even the most accurate and high end rifle and scope would not let you hit much if the mounting system does not fit any of them. Which of our selection is your perfect fit? UTG Pro SKS Mount: As the name implies, this scope mount model is the ideal fit for SKS rifles. The manufacturer makes sure that you have flexible adjustments so that you can make it as tight or sloppy as you desire. The 4-point rock solid locking system is a reliable feature that secures the accessory onto the receiver. Brass Stacker MN9130SSM Mosin Nagat Rifle Scout Scope Mount: This model is a sure fit to your Mosin Nagat rifle. It also fits other military surplus rifle in your collection. The accessory lets you mount long eye relief or LER optics and Scout Scopes. You don’t need any tapping or drilling of the receiver to install the mount. Global Sportsman SKS Mount: The mount is a suitable fit for all SKS models and variants due to its optimized dimensions. Various nods regarding the scope mount is attributed to the tight fit that makes it a reliable platform for your scout scopes. There are no modifications needed to fit your SKS rifle. What makes a good scope mount for your SKS rifle? Take a look at the design and feature and you will see its overall performance. Our list of the best SKS scope mount gives you an overview of the design and details in this important rifle accessory. UTG Pro SKS Mount: The top rail of the matte black mount is made from aircraft aluminum hard anodizing materials, providing integral shell deflector. 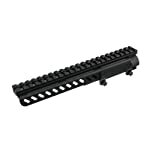 The 22 slot picatinny full length rail offers flexible optics application. Brass Stacker MN9130SSM Mosin Nagat Rifle Scout Scope Mount: The model consists of the picatinny rail with secured bolt and black oxide finish. The rigid steel construction makes it a good choice for scout scopes. Global Sportsman SKS Mount: The see-thru design of the mount lets you maintain usage of the iron sights. Your choice depends on your preferences and budget. Overall, the best SKS scope mount comes with other arsenal accessories such as scope for .22-250, scope for marlin 336, and shot timer. The MAGWEDGE “Quickrail” SKS scope mount is gaining popularity with there full lenght railing lift off rail and scope by removing quick pull pin for easy cleaning while keeping ZERO can also use different scope.